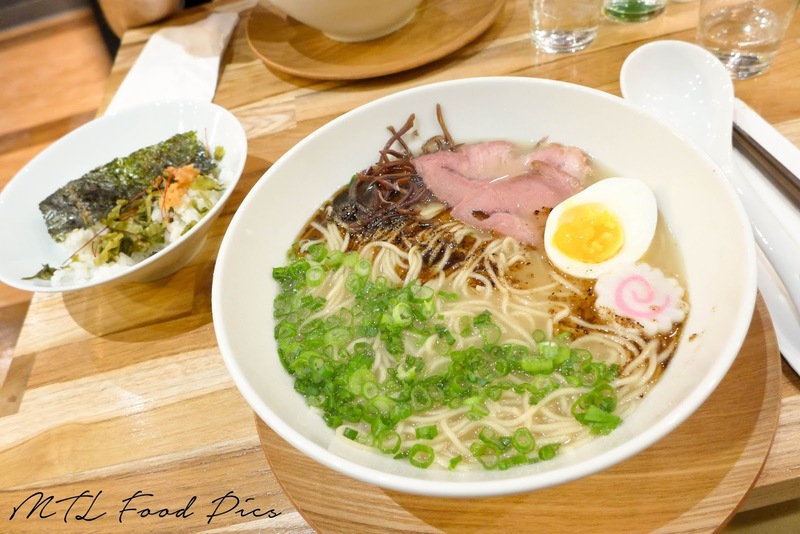 2016 will be the year where they will be a growing number of ramen restaurants in Montreal. Ramen is not something that can be whipped up in matters of minutes. This is the instant-kind of ramen that you eat when you are on a budget. Japanese ramen is all about executing every element perfectly. We are talking about broth, noodles, protein, egg and garnishes. It requires hours of dedication and patience to concoct one perfectly balanced bowl of ramen. Even up to this date, Kazu and Kinka Izakaya still serve the best ramen in Montreal. However, these ramens are the shoyu type (soy-based). I haven't found a good spot that serves the other common types of ramen - shio (salt), miso and tonkotsu (pork bone). I got to experience those ramen in other cities. 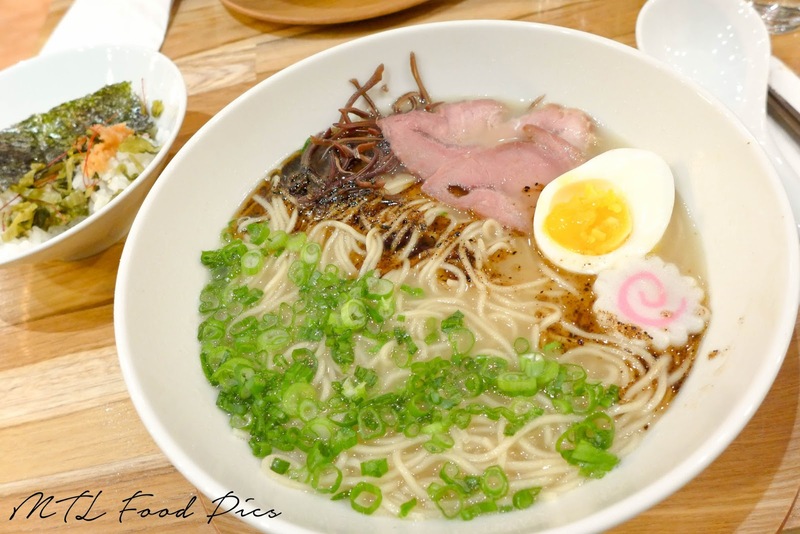 Some of my favourite ramen spots in Toronto are Hokkaido Santouka, Sansotei and Kinton Ramen. And in Ottawa, Ginza Ramen and Suisha Garden. Schlouppe Bistrot Nakamichi is the newest ramen spot opened on Mackay. It serves mainly tori-paitan, a unique ramen that is different from the ones mentioned above. Unlike the other ramen that the broths are made from pork and fish bones (and sometimes shellfishes), tori-paitan is made out of chicken bones that have been simmered for at least 7 hours. I went with my ramen buddy Carlos. We opted for the combo which includes: a rice bowl dish (donburi), ramen and dessert. For the donburi, we had the option of either ikura-sake (salmon roe & salmon chunks) or mentaiko-takana (spicy marinated cod roe & pickled mustard). At 7pm, they ran out of the first option. I opted for the second option. The mentaiko is salty and spicy, its texture resembles to a tartare. It is complemented with the sour pickled mustard. All these are eaten with warm rice and sprinkles of sesame seeds. Simple, a perfect harmony of flavours. Now onto the ramen, there are 3 ramen on their menu. The first two (daku & nouveau classique) are tori-paitan, the main difference is the nouveau classique comes with a side of spicy miso. You can change the taste of your ramen as you progress eating. The last item is truffle soba - a vegetarian ramen. We haven't ordered this yet, we will definitely try it out on our next visit. We both opted for the Daku tori-paitan ramen. The broth is subtle and milky. It has good depth of flavours and complexity that I'm looking for. The noodles are as important as the broth. The chef tends to choose the appropriate noodles for their ramen based on their texture, bounciness and the ability to cling to the broth. From my experience on eating ramen, I notice the straight thin noodles are used for subtle-flavoured broth. The thick wavy noodles are for rich flavourful broth. In this case, straight noodles are suitable for this tori-paitan ramen. The cha siu is pork that is cooked sous-vide. It's a method used to cook food at a fixed temperature, preventing the meat from drying. As a result, it gives a juicy and tender texture. The ajitama (a.k.a ramen egg) looks like a plain soft-boiled egg at first glance, but in fact, it is packed with umami flavour. Instead of marinating the egg in soy sauce, the egg is marinated in dashi (a mix of kombu and bonito flakes). 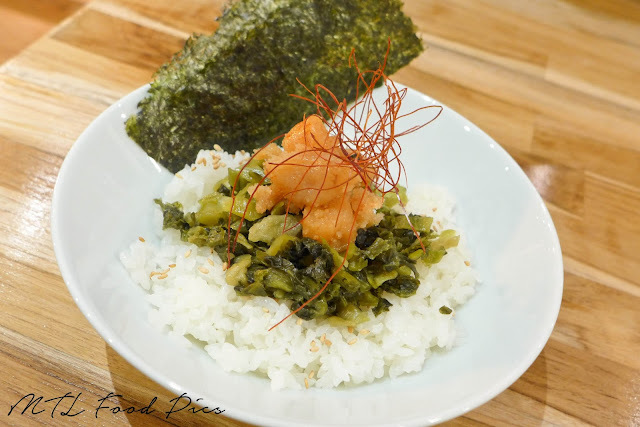 As for garnishes, it is served with julienned wood ear mushrooms (kikurage) for crunch, green onions for freshness and black garlic oil for earthiness. Overall, it is a well-composed ramen. We ended our meal with homemade green tea custard ice cream. Not only there is cream, it also contains eggs that give its rich creamy texture. 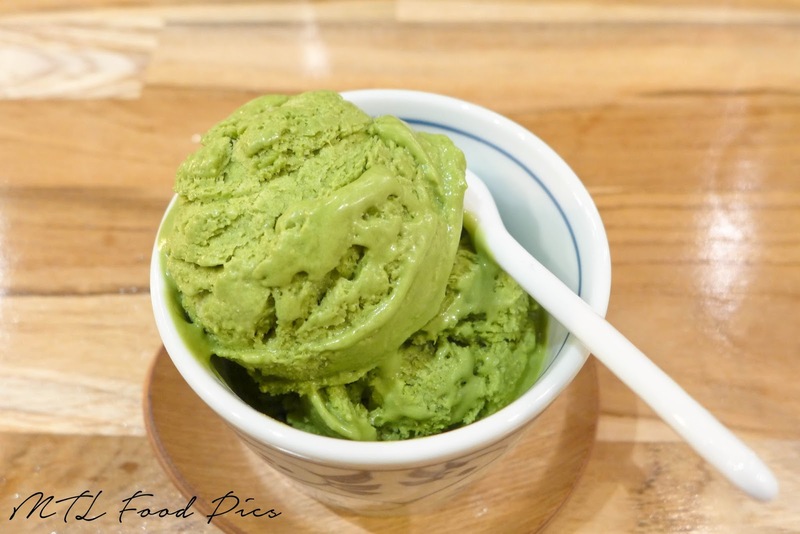 It is packed with matcha flavour - the best green tea custard ice cream I have ever eaten! Schlouppe Bistrot Nakamichi is such a long name, that it might be difficult to remember. Their ramen is tasty, authentic and unique. In no time, there will be a long queue in front of their door. Already 2 weeks since their grand opening, we had to wait 15 minutes in line when we arrived at 7pm. This shows that the ramen scene is definitely lacking in Montreal. I was told by the owner JP that they will have tsukemen on their menu. It's a special type of ramen where the noodles are separated from its broth. Read here to know more about tsukemen. This restaurant is still in infant stage. Even though the ramen tastes superb, the front-of-the-house needs improvements.